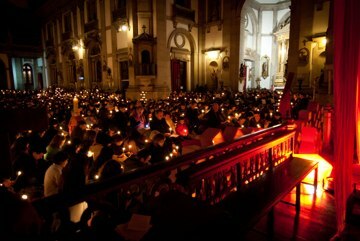 On the evening of 19 February 2011, the largest church in Porto was not big enough to contain all those who came together to celebrate the first anniversary of the pilgrimage of trust « to the wellsprings of joy”. In all, some 1500 people : hundreds of young adults, but also families who had welcomed the young pilgrims a year ago, and representatives of the Catholic Church, the Methodist Church, and the Old Catholic Church. A Taizé brother, from Chile, took part. Broadcast on internet, by means of a webcam, the prayer was followed by a number of young adults who were not able to come to Porto for the event. At the start of the celebration, the Bishop of Porto, Mgr Manuel Clemente, addressed those present. One year ago, we wanted to go to the wellsprings of joy, a joy which lasts. We think back to all that astonished us then. But there is also a call: the call to respond to the desire, which you express and which I am the first to share, for a deeper relationship with God and with all the others through God. It is this desire that the Taizé Community has been offering us for many years; that is what the Community shared with us a year ago. Many meetings for prayer have developed in the diocese since February 2010. We must try to understand the reason why so many people take part in these, and above all why they persevere so much. I think we are in the process of encountering the heart of God. We are rediscovering the heart of the Church and the Christian communities; as they offer themselves to the world as a place of meeting with God and with others. God is telling us this through our perseverance, through our prayer and our availability. We see there the future that God desires! The economic difficulties that weigh more and more heavily, the complexity of our societies that are sometimes overwhelming, the discouragement as we look at the future of Europe and even of the planet, all this tends to choke the plants of hope that are growing. So it is essential to create moments of life that make us sense that the Gospel is speaking the truth. And that is what you are doing through this new meeting. In order to be witnesses of the Gospel among those who are confided to us, each of us is called to deepen their personal relation with God: turning ourselves towards his light, rediscovering again and again the trust that God loves us and that we love God. And there is still another way of renewing our communion with God: it is in our attentiveness to the very poor. This can be expressed through a commitment in society, in exterior activities. At the deepest level, it is an attitude of openness towards all those who are confided to us, and who are, in a certain sense, poor people who have need of us. I would also like to say once again the final word I said just a year ago, at the end of our beautiful meeting: is not our response, to the trials we go through ourselves and to the trials others go through, to love more? If there were a sentence capable, even partially, of describing the feelings, the joy, the friendship, the peace, the love the kindness, the work and the effort of those who dream of creating a new world, it would be this verse from Psalm 133. And the experience of the Taizé meeting in Porto has given us that harmony lived out between brothers and sisters. Yes, “brothers and sisters” is certainly the correct definition of the relationship between all those who took part in the meeting. Leaving prejudices aside, be they religious, cultural, social or ethnic, gathered in order to share our lives, however poor and humble they may be, we have been enriched by the experience of those who, even by night, walk together on the same way, seeking for “living waters”. In the night of our life, the other person remains for each of us a light, simple and unique, who can enlighten and warm our hearts. The other person is all of this, because in him or her, we encounter Christ. Once a month, young adults organise a city wide prayer in the centre of Porto. Several parishes also organise regularly prayers with songs from Taizé. Photos of the evening prayer at Porto.